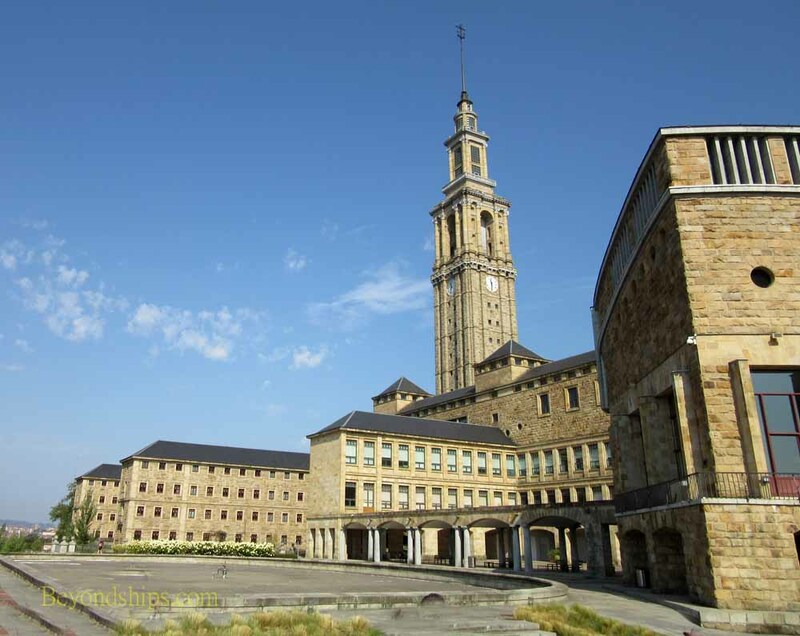 Situated outside of Gijon is a building complex that has been termed the biggest building in Spain, the Universidad Laboral of Gijon. The structure covers some 270,000 square meters. Built between 1946 and 1956, the building was erected when Francisco Franco was dictator of Spain and is a rare surviving example of authoritatian architecture. Franco was not popular in the Gijon area and according to some, this building was intended to demonstrate to the people of the region power and authority of his facist regime. It stands with its back to the city of Gijon. During the Franco period, the primary purpose of this complex was the indoctrination and training of Franco's followers. When Franco died, his regime collapsed and the building fell into disuse. In 2001, the government of Asturia took over the complex and converted it into the Laboral Ciudad of Culture. The objective being to use the building for furthering education, the arts and culture. As a result, it now houses a university, artistic training facilities and a conference area. The structure is monumental. Built around a giant coutryard, the main entrance is through a gate that echoes back to the Roman triumpal arches but on a grander scale. The courtyard is dominated by a huge domed church. It is the biggest church with an elipical dome in the world. More could sit on the benches that once covered the marble floor of this church. However, the grandiose interior décor was never completed and the building is no longer used for religious services. Nearby is a 1,500 seat theater. Overlooking it all is a tower rising nearly 120 meters. Outside, a formal garden lies to one side of the structure. It is an impressive structure. However, it is strangely lifeless and lacking in human dimension. That, of course, is an important goal of authoritatian architecture - - to convey the notion that the individual is insignifigant in contrast to the overwhelming power of the state. Nonetheless, the decision of Asturia to preserve this complex was well taken. It provides a chilling history lesson. And what better use to make of such a building than to foster and promote the expression of the human spirit.